The New Strike King TOUR GRADE FINESSE JIG is the pro's choice for finessing finicky fish. To meet the desires of tour level pros it includes; an incredibly sharp Gamakatsu hook for better penetration when setting the hook with light line, a wide football shaped head to enhance feel when contacting the lake bottom and help keep the jig upright, a 60 degree "flat" hook eye flush with the head to keep your knot in the proper position, a "crew cut" supple Perfect Skirt in beautiful colors, and a specially designed tapered barb "keeper" to securly hold soft plastic or Elaztech trailers. 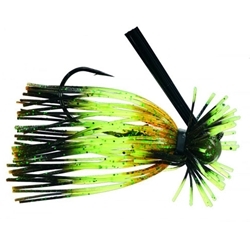 Only this new Strike King Finesse jig meets the Tour Grade standards!